12 pcs Anti Curling Carpet Rug Gripper. Large Size Reusable Carpet Anti-Slip Tape Keeps Rug in Place & Makes Corners Flat. Compatible with Any Hardwood and Tile Floors. Slipping floor rugs are more than just a nuisance. They can be very dangerous, especially for children and elderly people. Lock them down in place securely with this 12 pcs pack of rug grippers. Secure your rugs in just minutes with these easy to apply rug grips! Our goods are strictly inspected before shipment, so we are confident in the quality of the goods and promise you that if you are not satisfied with anything, please do not hesitate to contact us, we will give you a full refund. Note As well as other brands in the market, the floor side of our rug gripper is reusable, but the rug side is not. 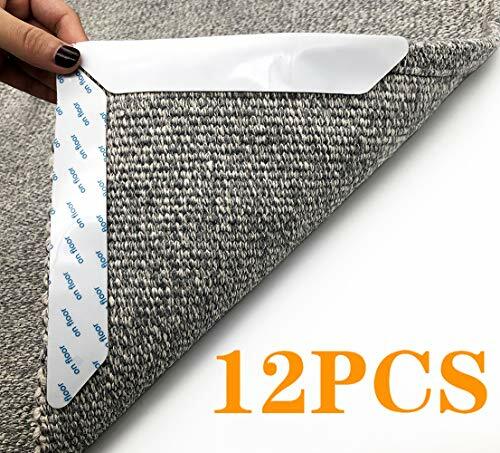 Try not to peel it off the carpet, or it may affect its adhesion to the rug surface.If you want to move the carpet, please tear off the rug grippers together with the carpet from the floor. Don't Wait For An Accident To Happen - Order Today!